The purpose of the article is to determine the role of tax regulation of banking activity and countercyclical regulation of banking activity (on the basis of formalizing the influence of the banking system on the development of the Ukrainian economy). It is more expedient to introduce a system of counter-cyclical tax regulation of banking activities whose purpose is: on the one hand, the containment of the development of factors of crisis phenomena in the banking system; on the other hand – accumulation of funds at the stage of economic recovery for the formation of financial support reserves for banks during the crisis and depression. Keywords: tax regulation, countercyclical regulation of banking activities. Cite as: Glants V. (2018). Optimization of Bank Expenses on Marketing Communications. 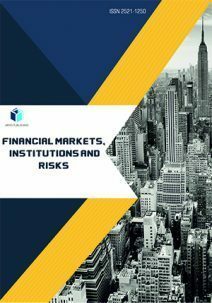 Financial Markets, Institutions and Risks, 2(1), 37-49.